Part of the practice is in creating new sketches, experiments. Learning the system and discovering what I can do; what I want to do. 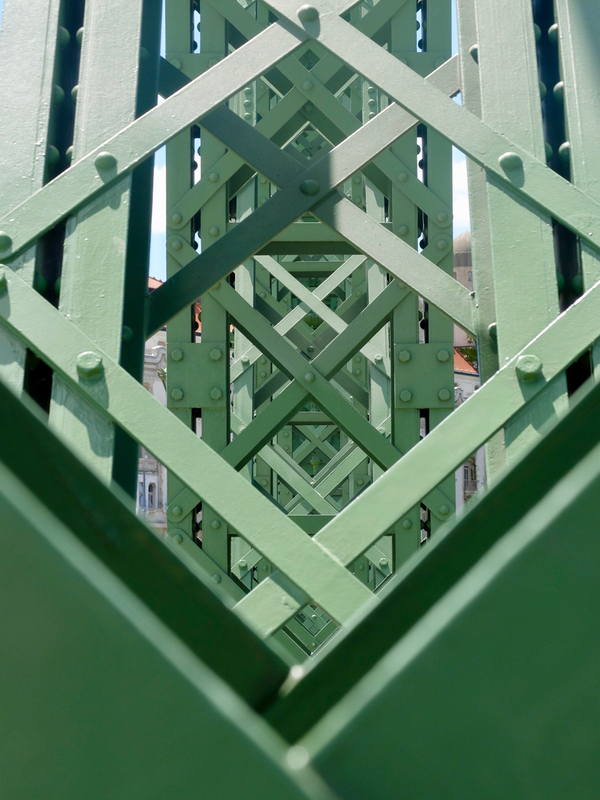 I record Szabadság, the beautiful green ‘Liberty Bridge’ built by a railroad engineer, iron and graceful and tough. 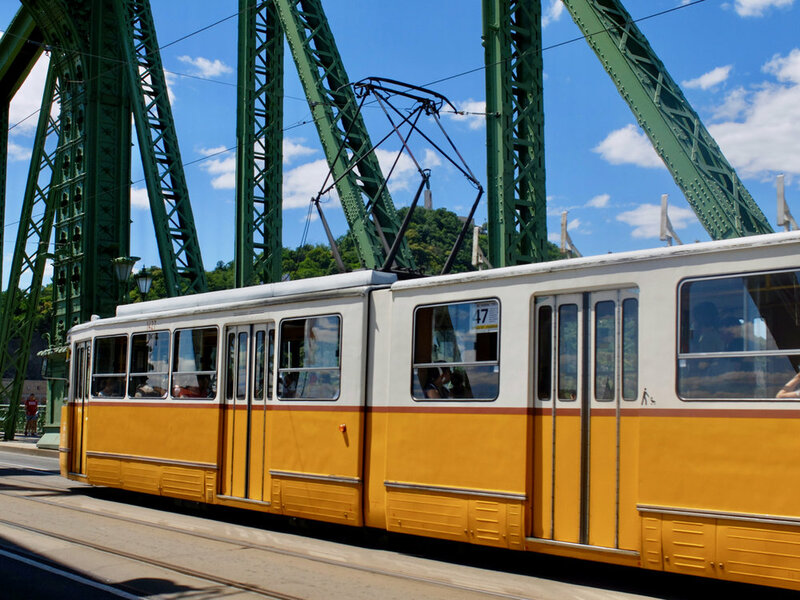 Trams run across the bridge creating a rhythmic music. In the studio, I bring the tram through the room, from outside one end, across the centre, out the other wall. It has a true weight, a true rumbling dimension. It is an object that, when I close my eyes, I can feel moving through the space. This is not just a given in this studio – the effect (every effect) needs to be created. I have to break down the recorded sound into its elements, extract those elements that need to move, re-insert them as individual objects, and move them. Control the doppler effect, the real-world effects of objects moving through space. What is a given in this studio is that you are working with sound in a very physical sense, and this is changing the way I work on a fundamental level. Next I place a recording of breathing and a recording of a speaking voice and I aim to place them where a speaking voice would be in physical space – the dimension, the height, the resonance of a person, about 5’10”, walking across the room. Late one night, I’m standing alone in the studio focused on something else when heavy breathing (that I’ve forgotten about) approaches me from behind, passes through and around me and continues on … scaring the hell out of me. Again, the physicality of the sound is becoming super clear. Still waiting for the content for the Sonority work, I begin an entirely different composition. It develops out of three things: experimentation with sounds under the floor, specifically creating the sounds and sense of an ocean beneath our feet; a meditation on trust as a way of flowing with the necessary waiting-time as this project develops, which manifests as a new poem written on walks around Budafok; and the melody of the Seikilos Epitaph - the oldest complete song notation known. I have had a midi file of this melody for a long time but have never used it. Early on a Saturday morning, I weave it into a piece that contains a multitudes of old dreams. Dreams from Greece, from visiting the Delphi oracle and receiving the word “TRUST”. Sounds of the ocean, the wind on the Acropolis hill. Dreams from Australia, from times of mistrust. Sounds of the wind, the birds of Bondi. Dreams from Barcelona, from times of misplaced trust. Sounds of the streets of the Raval, a storm recorded on a rooftop. And dreams from Budapest, the present, where trust is coming into sharper and easier focus. Sounds of friends splashing in puddles in a downpour, thunder resonating around the buildings of Budafok, the trams running across the Szabadság bridge, city traffic in the rain. Once the recording for the Hungary piece begin, I’ll shelve this. But it feels like a piece that needs to grow, and hopefully will manifest in another time and place, another context. Postscript: This piece, called “Bizalom”, continues to develop. In October in Athens I performed it live in Chimeres Space, using a video mix made from videos of my travels in the previous months.